Like his iconic counterpart, Rob Garrett was born in New York City. He began learning to sing and play guitar at the age of 14. In 1974, his parents relocated to Las Vegas which still remains his home. In 1980 he formed the group "Rock 'n' Roll Heaven" and for 15 years, achieved prominence as the leader and front man of Las Vegas' premiere "oldies" and classic rock group. The band earned a large local following, performing consistently in various bars, clubs, lounges, and showroom's around Las Vegas. In 1994, fully aware that the celebrity impersonator industry was becoming a huge business, Rob made the decision to take his career in a different direction by paying tribute to one of his all time boyhood idols (and musical influences), the legendary Neil Diamond. Rob personally auditioned for Paul Revere (founder/leader of the "Raiders") for "Legends in Concert'', which was known as the most popular celebrity impersonator production show in the world. He got the job and worked with 'Legends' for the next 5 years. 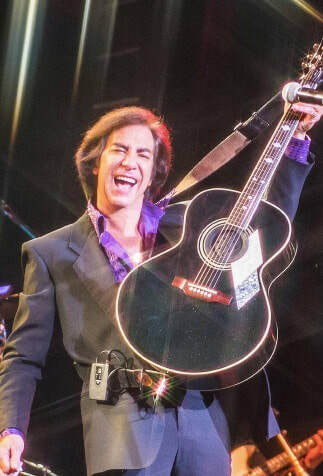 Today, Rob Garrett has established himself as the world's most popular and requested Neil Diamond tribute artist, earning the title "King of Diamonds". He continues to set the standard in the industry by performing his tribute the iconic singer/songwriter around the country in venues usually reserved for national/name acts. On Sept. 17th, 2013, Rob became the first tribute artist ever to receive the “Tribute Artist of the Year”/”Excellence in Entertainment” award from the Entertainment Consumers Exchange and on October 24th he was honored by the Cystic Fibrosis Foundation - Southern Nevada Chapter as one “Nevada’s Finest” for his contributions in the Entertainment field. On January 17th, 2015, Rob performed to 2000 patrons, his largest audience ever in Las Vegas, in the Grand Events Center at Green Valley Ranch/Resort. February 6, 2016 – Rob performs a 90-minute show with members of his band along with the 50-piece Temecula Symphony Orchestra for a packed house in Temecula, CA. April 21st, 2016 – Rob makes his professional big screen debut in a movie entitled “DIAMOND MOUNTAIN”, a documentary focusing on Neil Diamond’s ongoing popularity and influence in the Tribute Artist Industry. A world tour concert of the movie is in the making. Longtime Las Vegas columnist Norm Johnson wrote… “Of all the Tribute Artists running around Las Vegas (and elsewhere), there is none better than Garrett” and Mike Weatherford, entertainment critic for the Las Vegas Review Journal wrote “Garrett does sound astonishingly like Diamond…”.